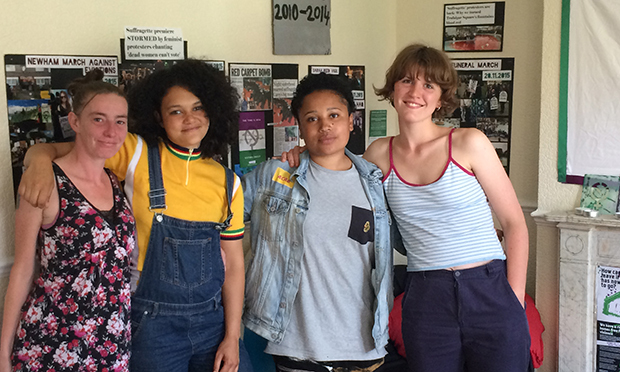 Activists from the campaign group Sisters Uncut have occupied an empty council flat in Homerton in protest against the lack of social housing in Hackney for victims of domestic violence. 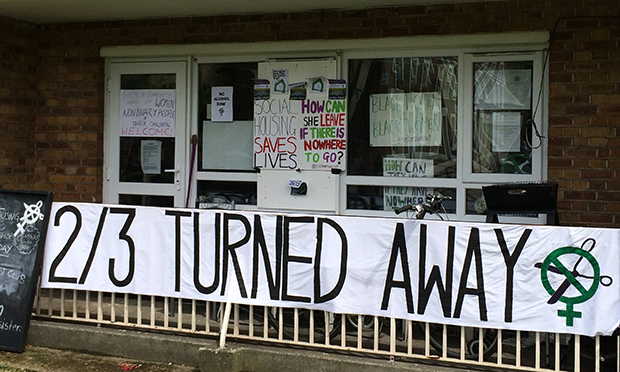 The feminist group seized the Marian Court flat last Saturday, following a rowdy demonstration against cuts to domestic violence services outside Hackney Town Hall. It claims that a “scarcity of secure social housing” and “deep cuts” to the funding of refuges means victims of domestic violence regularly have nowhere to go. On the balcony outside the flat is a large banner, reading “2/3 turned away”. According to a 2013-2015 Women’s Aid report, more than 60 per cent of applications to women’s refuges in Hackney are unsuccessful. At the same time, a Freedom of Information request from February 2016 has revealed that 1,047 council-owned residential properties in Hackney lie empty, such as the one the group currently occupies. Sarah Kwei became involved with the group after becoming disillusioned with her job as a domestic violence support worker. She said: “If a [domestic violence] perpetrator knows where you live then you have to leave in order to be safe. With refuge spaces being cut and with there being no council housing, leaving is becoming less and less of an option and is putting women’s lives at serious risk. The all-female group, which became famous for storming the Suffragette film premiere and dying the Trafalgar Square fountains blood red, has also warned that the Housing and Planning Act, which became law in May, will “increase homelessness and polarise communities”. According to figures obtained by former London Assembly member Darren Johnson in February, Hackney is set to lose 915 socially-rented homes as a result of estate regeneration in the coming years. “There’s no housing but also they’re demolishing council estates through estate regeneration so we felt really outraged by it so that’s why we’ve taken this place,” Kwei said. Sisters Uncut is convinced that direct action is the best way to draw attention to domestic violence, and draws on the success of other branches of Sisters Uncut around the country. The protesters say their actions in transforming an empty flat into a ‘women-only space’ merely echo how the first women’s refuges came into existence. The group claims to have the support of residents in neighbouring flats, and is engaging in community outreach work by holding evening workshops centred on domestic violence, as well as a breakfast club for children every morning. Hackney Council was asked for comment at 1.30pm on 11 July 2016 and responded at 5:45pm on 12 July 2016. Commenting on the figures cited, a council spokesperson said: “Hackney does not have 1,047 empty council properties. This statistic was provided in error in response to a Freedom of Information request earlier this year. “144 are unfit for occupation and cannot be repaired before demolition, 286 are currently empty, but are in the process of being let as temporary accommodation. 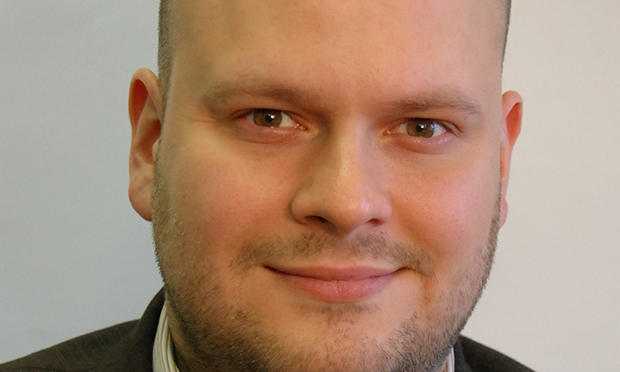 Commenting on the issues raised in a council statement to the Hackney Citizen, Cllr Philip Glanville, Deputy Mayor and Cabinet Member for Housing, said: “We take our duty to victims of domestic violence extremely seriously, and do everything we can to make sure they get the right support and appropriate accommodation. “I look forward to meeting campaigners to discuss their concerns and how together we can press the government for better help and funding in tackling the housing crisis. “Despite government cuts, we increased spending on domestic violence support last year, as well as funding the third highest number of refuge spaces in London. “We work closely with charities and other organisations to provide a safe place for anyone suffering domestic abuse, as well as training professionals to help more victims obtain court injunctions against violent partners. “It is not true that there are more than a thousand empty council homes in Hackney. When council homes become available, we use them to home those most in need as quickly as possible, with only a handful of properties with complex problems left empty for any long period. “Hackney has one of the most ambitious regeneration schemes in London, which will see thousands of properties that are uneconomical to repair replaced with modern new council homes. “Wherever we can, we will use homes set for demolition in the future as temporary housing – and we’ve already housed more than 260 families in this way. “The only reason we wouldn’t do this if the homes are due to be imminently knocked down or in a dangerous condition. “It’s also untrue to suggest we are reducing the number of council homes in Hackney through regeneration. “Hackney has actually built the second highest number of council homes in the country, and where we are demolishing council homes, we are actually replacing them with more than we started with – alongside hundreds of additional homes for shared ownership. “We have been extremely vocal in our anger and opposition to the government’s housing reforms, including the Housing and Planning Act, which only serves to exacerbate London’s housing crisis and make it even harder for councils like Hackney to ensure local people can find an affordable place to live. “I have personally given evidence in Parliament about the devastating impact these changes will have on families in our borough and joined three national marches, as well as writing to ministers, the Mayor of London and housing associations to outline why this legislation is wrong.